Fortunately I was able to try a little bit of everything. I ordered the ribeye, my wife ordered the marinated porterhouse, and a friend ordered the “surf and turf,” which came with the non-marinated filet. First of all – the ribeye was perfectly cooked from end to end (9/10). Exactly spot on medium from the fat cap all the way to the bone. That is amazing. A bit more crust on the top and bottom would have sent this baby into the 10-spot, but it is certainly a solid hunk of meat. The marinated cuts soak for three days in what I guess is a sweet garlic-soy concoction. It was really nice for the first few bites, but after a while it is a bit much (8/10). Stick with the standard preparation, even though they offer “Oscar” style (with crab meat), and “Tuscan” style (with Gorgonzola melted on top). The filet side of the porterhouse was tender and juicy, as was the strip side. The non-marinated filet that came with the surf and turf (soif & toif) was perfectly cooked, but it lacked seasoning. I’m not sure if they use a different cut for surf and turf than they do for the petite filet, but that could be why there was a lack of flavor intensity (7/10). But if you go for the standard beef cut to test the mettle of the meat (aka the ribeye) you will not be disappointed. There were clean bones all around the table, as five of us ordered the ribeye. Pace’s has most of the basics. They have filets in two sizes (7-9oz; 10-12oz), a ribeye (24oz bone-in), and porterhouses (30-32oz for one; 52-56oz for two). What is missing you ask? The strip. They offer a double cut sirloin (20oz), and a NY shell steak (20-22oz). The shell steak is meant to be considered a “strip,” but come on – lets get with the program. Get the real thing. Portions are just right. The ounces listed above are on par with the big dogs of steakhouses. Bone in or boneless, you get a good amount for your dollar here. These were fair prices, especially when compared to NYC steak joints. The most expensive cut of meat is $45 (porterhouse for one). Ribeyes price in at $42, and filets at $32 and $38. Seeing a filet under $40 is refreshing these days. The bar is nice – not too big, not too small. I could definitely see myself hanging here for a drink and some bar food. The only problem is that Port Jefferson is so far away. 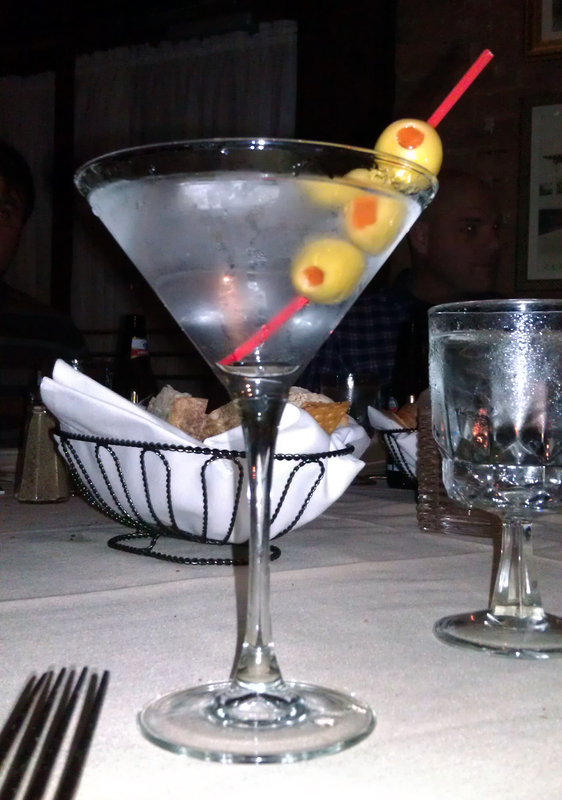 They made a nice, ice-cold martini to my liking: Beefeater up, very dry, and with olives. Roasted chicken, Long Island duckling, rack of lamb, and double center cut pork chops grace the alternative meats menu here; a good selection (hats off to the duck, which I like to see on steakhouse menus), but no other beef cuts like flank, skirt or hanger. On special there were some enticing seafood items, like Chilean sea bass and some lobster items, along with a few apps. I tried the crab cake and the “filet mignon spring roll” appetizers. The crab cake could have been a bit lumpier (as in less shredded and “filled”), but it had a good crunch to it, and good flavor. The special filet mignon spring roll with Gorgonzola cheese was okay. There was some chew to the meat, which was slightly disappointing, but overall it was interesting and worth a detour from the usual orders (oysters, wedge salad, etc). For sides we had creamed spinach, steak fries, and mashed potato. The mashed had a bit too much garlic for my liking, and were a bit dry inside (I admit that I am spoiled by my mom’s mozzarella mashed potato platters from childhood). Everyone at the table liked it except for my wife and I. The steak fries were nothing special to me either, though others did like them. I’ve personally had better at my local “Carousel Diner” in West Islip. The creamed spinach was good though: not too heavy (a dark green color), but it had enough creamy smoothness to cut the salty meat in between bites. Nicely done. Seafood is delivered fresh daily to Pace’s, so you have to go there to see what is offered. A regular menu item, however, is lobster (starting at 2lbs). They only had one featured seafood item on special, which was a horseradish crusted Chilean sea bass on top of a bed of sauteed spinach. It sounded marvelous, but since we didn’t have our dicks tucked back into our asses like a bunch of nancy-boys, we all decided to get meat, like real men (ladies included). Two more seafood items might have boosted the points here. I am not one to order seafood entrees at a steakhouse, but sometimes I want a good selection. Perhaps Pace’s is confident enough in their meat and fish to only have the one item offered? Bold move? Maybe. Since I didn’t try it, I can not properly judge. Based on lack of choices, though, I have to take a couple of points off. Our waiter was great. We didn’t really test his knowledge, but he was attentive, and made good suggestions in terms of appetizer sizing and what he thought was good. The bread was warm and multifarious. The whipped butter was cool and hard at first, but it quickly became spreadable. Situated in picturesque Port Jefferson Long Island, Pace’s is located on a narrow one way street just off the main strip of town, in an old historic structure that was probably built in the 1600’s or 1700’s. The walls are exposed brick, the trimmings are nice wood blinds and wood-colored drapery. Pictures on the walls are old Long Island street scenes; authentic and classy without being cliche. There are several alcoves and small dining areas that offer privacy while still allowing for the feel of community in the dining space. It is cozy, but not stuffy or tight-spaced. An interesting touch: the bathroom is equipped with a mouth wash dispenser and small dentist-office cups for rinsing out. They also stock that baby with quality disposable thick cloth hand towels. Bonus.